The shores of the Chesapeake are spotted with harbors and marinas of various sizes. Most waterfront communities in Maryland and Virginia have some sort of marina. Some are full-scale resorts with pools and restaurants, others are smaller operations that offer slips and basic amenities. There are marinas where locals keep their boats long-term and those where transients stay for a day or two. Most marina facilities provide some combination of the two. Cruising between the Bay’s many marinas and protected anchorages is a favorite activity of cruising boaters. You’ll sometimes see clubs or boaters traveling together on the weekends. 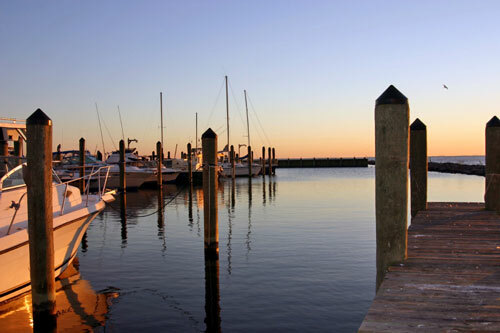 We feature some of the Chesapeake Bay’s marinas here in our directory. You’ll find brief descriptions of amenities and services provided here, but for detailed information about each marina, please click on the marina name to go to their website. Marina Owners: If your Chesapeake Bay marina isn’t on this page, send us a request for a link. Include your website address and contact info. There are resort hotels in Chesapeake Beach, Irvington, and Cambridge that have slips for cruising boaters. Visit our Chesapeake Bay Resorts page for details about these properties. Havre de Grace, Northeast, Georgetown, Rock Hall, and Chestertown. Susquehanna River, Northeast River, Elk River, C&D Canal, Bohemia River, Sassafras River, Worton Creek, Fairlee Creek, Swan Creek, Chester River, Bush River, Gunpowder River, Middle River. Bohemia Bay Yacht Harbour. Bohemia Bay Yacht Harbor is located on the Bohemia River, or from land, just south of Chesapeake City, MD. The marina facilities are family-oriented, quiet, and an excellent environment for fun and relaxation. Bohemia Bay’s service yard is staffed with factory trained, certified mechanics with over 60 years of combined experience. The ships store offers snacks, cold drinks, boating supplies, fuel, ice, and holding tank pump-outs. Bohemia River, Chesapeake City, MD. Middle River Landing Marina. Over 100 slips in a secluded, private setting at the headwaters of Middle River. Full service/self service boatyard with two travel lifts and fully stocked marine store. Amenities include a secure, gated entry, full bathrooms with showers, metered electric, picnic areas, grills, 24-hour ice machine, and on-site mechanical work. A slip-holder lounge is new for the 2015 season. Middle River, Essex, MD. Skipjack Cove Marina. Skipjack Cove is a resort marina with Olympic pool, full menu restaurant with deck, wireless internet access, cable, tennis, basketball, exercise room, fuel dock, pump out, full-service yacht service, kiddy pool and playground. Transients welcomed. Sassafras River, Georgetown, Maryland. Triton Marina. Triton Marina is a full service facility located at the headwaters of the Chesapeake Bay, half way between Philadelphia and Baltimore, only 8 miles from I-95. Eight park-like acres, 3 sandy beaches, with 200 floating and fixed slips and a “State of the Art” High & Dry Boatel with two, 22,000 lb forklifts and a 40-ton travel lift. Certified service department for Mercruiser, Volvo and Yamaha outboards. Home to Triton Bar and Grill with live entertainment plus packaged goods. Dealer for Tahoe Pontoon Boats. Large selection of pre-owned and brokerage boats. New tenant discounts available on the High & Dry facility – save up to 15% on boat slips. Tenants receive deep discounts on fuel. Elk River, Elkton, MD. Sunset Harbor Marina. Family-owned marina on the Middle River in Essex, Maryland. Amenities include newly remodeled restrooms and showers, a marine store, pump-outs, picnic tables and grills, and certified Mercruiser and Volvo service. Middle River. Essex, MD. Worton Creek Marina. A full service marina located 1.5 miles off the Bay, on Worton Creek. Voted #1 “Best of the Bay Mom and Pop Marina” for six years. Marina amenities include a restaurant, swimming pool, gas and diesel fuel, propane, ice, coin laundry, air conditioned bath houses, picnic area with gas grills, catering available, marina store, and parts store. Full service boat yard for repairs and maintenance. Worton Creek, Chestertown, MD. Baltimore and Annapolis. Back River, Patapsco River, Magothy River, Mill Creek, Severn River, South River, Rhode River, West River. Baltimore Marine Center at Harborview. Located on Baltimore’s Inner Harbor, Harborview offers floating piers, pool, fitness center, ample parking, two restaurants on site, and easy access to Baltimore’s many attractions. Located on the Patapsco River, at Baltimore’s Inner Harbor. 500 Harbor View Drive, Baltimore, MD. Chesapeake Beach, Solomons. Herring Bay, Patuxent River, St. Jerome Creek, Potomac River – Maryland Shore. Buzz’s Marina. Boat and camper storage. Slips, dry and covered. Gasoline, ice, bait and tackle store, two public ramps. Set on 82 acre farm, quiet and picturesque. Minutes to the Bay, come fish with us! Located on St. Jerome’s Creek. 49675 Buzz’s Marina Way, Ridge MD. Harbour Cove Marina. Harbour Cove Marina is the closest full-service marina to the Washington Metropolitan area. Located in Deale, Maryland, Harbour Cove provides all the things you expect in a full service marina, and it’s just 20 minutes from the Capital Beltway. Located on Rockhold Creek, off Herring Bay. 5910 Vacation Lane, Deale, Md. Herrington Harbour. Eco-Lifestyle Marina Resorts. Two marinas. Herrington Harbour South Marina/Resort and Herrington Harbor North Marina/Yacht yard. Solomons Harbor Marina. An 80 slip, resort style marina adjacent to the Holiday Inn offering long and short term dockage to 100′ LOA. 30/50 Amp., Pool, Tennis, Health Spa, Wireless Internet. Easy walk to shopping center, restaurants and Calvert Marine Museum. Groups welcome. Located on Back Creek, Solomons Harbor. 205 Holiday Drive, Solomons, MD. Spring Cove Marina. Marina with extensive picnic grounds, 25yd heated pool, restaurant, gift store, fuel dock, and full service boatyard in a quiet setting. Located on Back Creek/Patuxent River. 455 Lore Road, Solomons, MD. Zahniser’s Yachting Center. Marina and Boatyard located in the heart of Solomons Island, Maryland. Enjoy modern conveniences with a resort style feel. Clean restroom suites, swimming pool, The Pool Bar Café, The Dry Dock Restaurant, courtesy bicycles, shuttle to groceries, recycling center, pet friendly, and WiFi are a few of the amenities provided. ZYC also has an award winning service yard, with factory trained technicians ready to assist you with everything from routine service to emergency repairs. Colonial Beach, Kinsale, Reedville, Lancaster, Deltaville, Mathews County, Irvington, Urbanna. Potomac River – Virginia Shore, Little Wicomico River, Great Wicomico River, Rappahannock River, Piankatank River, York River. Compass Marina. Located at the mouth of the East River off Mobjack Bay. Mathews County, VA. 17 slips can accomodate boats from 25 to 50 feet. Floating docks, pump-out at any slip, power up to twin 50amp service, bath house, laundry, high-speed wifi. Crown Pointe Marina. Full service 235 slip marina located just off the Chesapeake Bay on the York River in Gloucester, Virginia. Complimentary pump-out, fuel, two swimming pools, air-conditioned bath facilities, laundry, business center with complimentary internet access, and Ship’s Store. Boat US Cooperating Marina. Located on the York River, near Gloucester, VA. 9737 Cooks Landing Road, Hayes, VA.
Horn Harbor Marina & Boatyard. On the Chesapeake Bay in Mathews County, VA. Family-oriented marina with a fire pit, swimming pool and family lounge. Floating slips, fuel, pump out, water & electric, showers, ship’s shore, on-site service and repairs. Morningstar Marinas Gwynn’s Island – a full-sevice marina with amenities that include a ship’s store, fuel dock, and showers. Gwynn’s Island, Mathews County, VA.
Urbanna Town Marina at Upton Point. A transient marina operated at Upton’s Point on Urbanna Creek. Trolley service to downtown. Dozier’s Port Urbanna Town Center Marina. Short walk to town. Full boatyard service. Restaurant and bar. Urbanna Yachting Center. Large marina with repair services. Urbanna Creek Marina at the Bridge. Located adjacent to Urbanna Creek Bridge. Regent Point Marina. Quite park-like setting. All sailboats. Many family amenities like bicycles, canoes, playground, picnic area and kayaks. Boatyard on site with hauling and repair capabilities. Safe harbor during storms. Located on Locklies Creek, off Rappahannock River, near Urbanna, Virginia. 317 Regent Point Drive, Topping, VA.
Kent Island, Easton, St. Michaels, Oxford, and Tilghman Island. Kent Narrows, Miles River, Knapps Narrows, and Tred Avon River. Campbell’s Boatyards. Three full-service locations in Oxford. Bachelor Point, Town Creek, and Jack’s Point. Fuel dock at Jack’s Point. Knapps Narrows Marina. Tilghman Island, MD. Located adjacent to the Knapps Narrows Bridge. Full service marina and boat yard with waterfront inn, restaurant, and tiki bar. Oxford Boatyard. Full service boat yard in Oxford. Transient dockage to 110′. Ship’s store. Laundry and showers. Mears Yacht Haven. On Town Creek in Oxford. Yacht club setting with pool, fuel, supplies, bike and car rentals, laundry. St. Michaels Marina. Located in center of town, close to restaurants and shops. Cambridge, Deal Island, Crisfield, Onancock, and Cape Charles. Choptank River, Little Choptank River, Honga River, Wicomico River, Little Annemessex River, Tangier Sound, Pocomoke River, Onancock Creek, and Kings Creek. Port of Salisbury Marina. Designated as a Maryland Clean Marina, The Port of Salisbury Marina is situated in downtown Salisbury Maryland. Located at the headwaters of the Wicomico River, it is a freshwater marina with an 8 foot average depth at low tide. The marina is within walking distance of the old town Salisbury. Kings Creek Marina. Cape Charles, VA. Formerly Bay Creek Marina. Renovated and reopened. Marina store, Marina Villages rentals and Bimini Flats Suite Rentals. Aqua restaurant and events center. Golf cart & bike rentals. Kayak and paddle boat rentals. Poquoson, Hampton, Chesapeake, and Norfolk. Poquoson River, Back River, Hampton River, Elizabeth River, and Lynnhaven Inlet. Atlantic Yacht Basin. Atlantic Yacht Basin is a family owned full-service yacht repair, transient dockage, and storage facility that offers a variety of services, parts, and fuel. Located on marker 12 of the Atlantic Intracoastal Waterway, AYB is known for its courtesy, professionalism, and friendly approach. AYB is skilled in restoring and repairing older vessels, as well as boats that require newer marine technology and techniques. Chesapeake, VA.
Dare Marina & Yacht Sales. Dare Marina & Yacht Sales is located on Chrisman’s Creek, offering a protected deep water harbor minutes from the Chesapeake Bay, where customers can enjoy some of the best fishing and cruising grounds on the East Coast. Located on Chrisman’s Creek, off the Poquoson River, near Yorktown, VA. 821 Railway Road, Yorktown, VA.